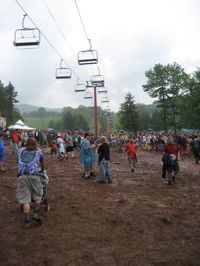 What did they do to our ski mountain? But Michael Franti and Spearhead, that’s a different story. 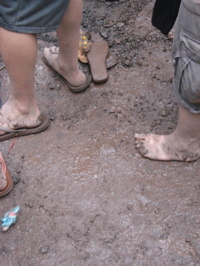 If I’m going to spend a late Sunday afternoon in the mud, on the side of a mountain, at the end of a thunderstorm-ridden weekend, surrounded by 5,000 hippies, then it may as well be to watch Spearhead fronted by Michael Franti, one the world’s truly beautiful people – a cheerful humanist, a political pacifist, a charismatic performer and more. Indeed, sometimes too much more. As a band-leader whose group straddles reggae, hip-hop, rock, dub, with some funk, jam band blues and both acoustic and anthemic rock thrown in, Franti can be too many things to too many people, and there were a few times during the 100-minute show at Hunter that the set dissolved into platitudes: once you’ve been encouraged to “jump up and down” five times, you really don’t need to be told fifteen times more. Then again, Spearhead’s blend of political party music makes them the perfect festival group – especially to the Woodstock jam band crowd, for whom they provided possibly the only opportunity all weekend to dance, skank – and yes, jump around. 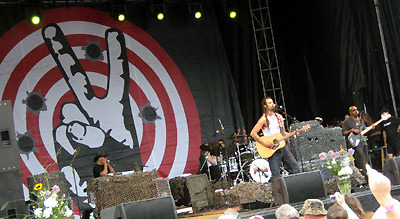 But it does both Franti and Spearhead an injustice just to focus on the set list. The group’s stage show is rendered stronger by Carl Young’s occasional heavy dub bass, Nigerian drummer Manas Itene’s falsetto vocals, and by such welcomely bizarre interludes as the voguing flower arranger who turned ‘High Low’ into something of a Manhattan gay club vignette. Every group should have its own flower arranger! Similarly, certain lyrics jump out – as they’re meant to. ‘Sweet Little Lies’ contains the lines “tell me that the rain won’t fall today ” and “tell me that somebody stopped the war,” both in the first verse. 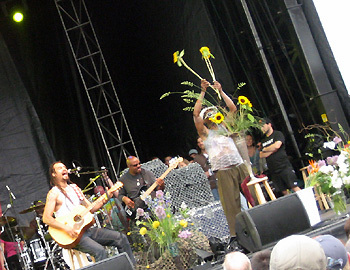 (Franti introduced it like a true planetarian by offering a “blessing for nature’s bounty – including the mud, rain, the wind and the occasional sunshine.”) ‘East To The West’ has the equally emphatic “God’s too big for just one religion.” And ‘One Step Closer To You,’ essentially a rewrite of ‘No Woman No Cry’ (the group briefly covered Bob Marley’s ‘Stir It Up’ and ‘Get Up Stand Up’ earlier in the set) is essentially a spiritual cry: “I believe in the one above, I believe in the one I love.” The positive mantras are so all-embracing that, as Spearhead broke into a surprise version of ‘Sesame Street’ (as a twisted rejoinder to something serious I forgot to make note of), a mother bear and her three cubs were seen wondering down from the top of the mountain, as if looking to join the party. Franti exudes natural leadership skills, but doesn’t abuse them. 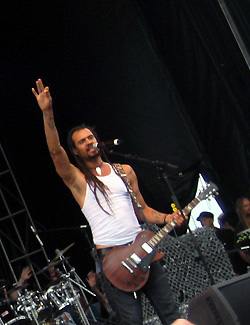 The most profound moment of this show occurred when Franti talked about a recent gig where a new convert stayed up all night chatting with him – then went home, looked up the Spearhead web site, and when he saw the group were playing San Quentin, found Franti on the phone to tell him, “My sister was killed and raped by a man who is now in San Quentin, on death row. How dare you go play for that monster?” Franti’s answer (one he said he needed to define for himself after this call): “I don’t play music to punish or reward anyone… I play music to free something stuck in my heart,” with the hope that he can have a similar effect on his listeners. He does. He certainly knows how to relieve the blues, get people dancing and thinking, and how to send them packing with all life’s positivity re-affirmed. You can’t help but feel that if the world were full of Frantis, there wouldn’t be a San Quentin death row. But of course, it’s not, which is why, if you’ll excuse the appropriately corny nature of my observation, we so need the ones we have. Especially when they can deliver a live show this exuberant.